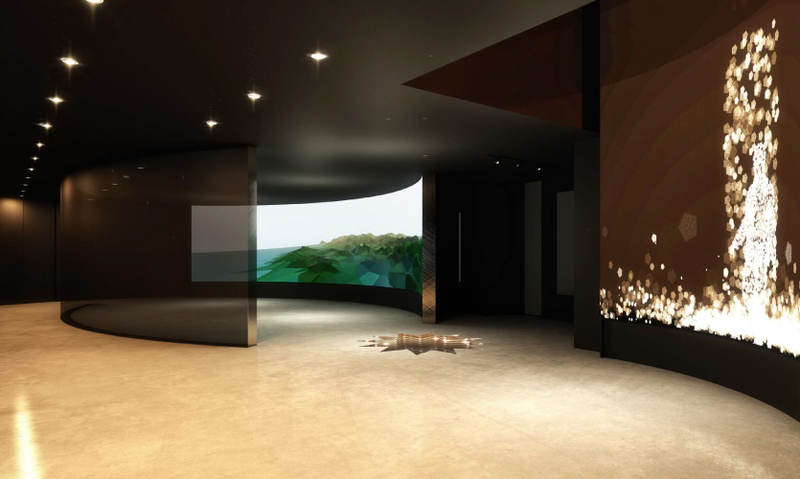 The 360 Landscape is a 50’ x 30’ interactive projection-mapped ellipsoid space. It surrounds visitors with an abstract representation of the topography of Los Angeles, as rendered from the viewpoint of the tower. Playfully-animated graphics for points of interest that are visible from the top floor. A gem cracks open to reveal a point of interest. 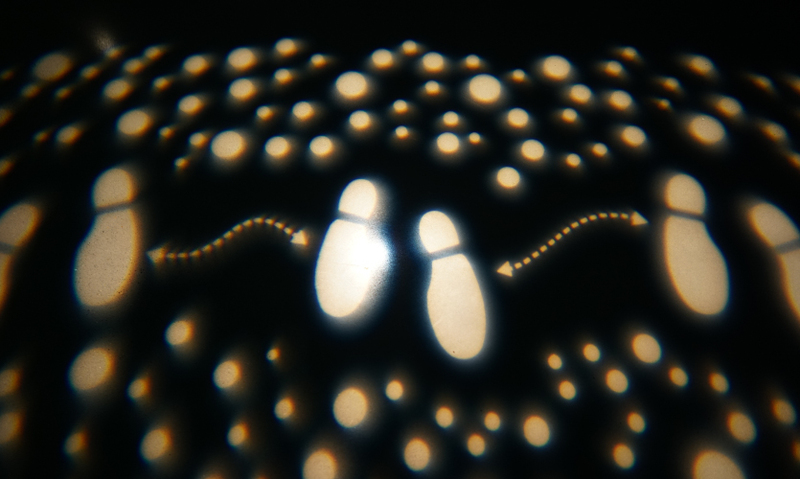 Visitors move around the space at their own pace to crack open each gem. A custom-fabricated railing hides a collection of LEDs which animate in front of visitors as they approach. A rendering of the space. 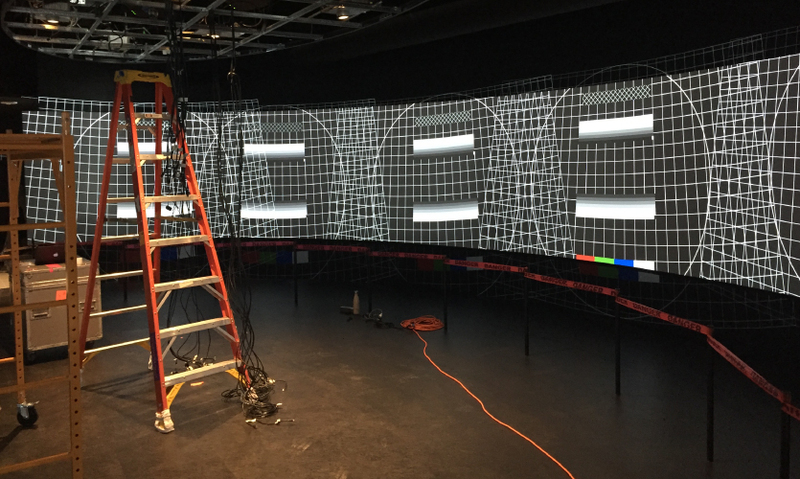 A behind the scenes view of the 360 Landscape setup. Another peek at the setup process. 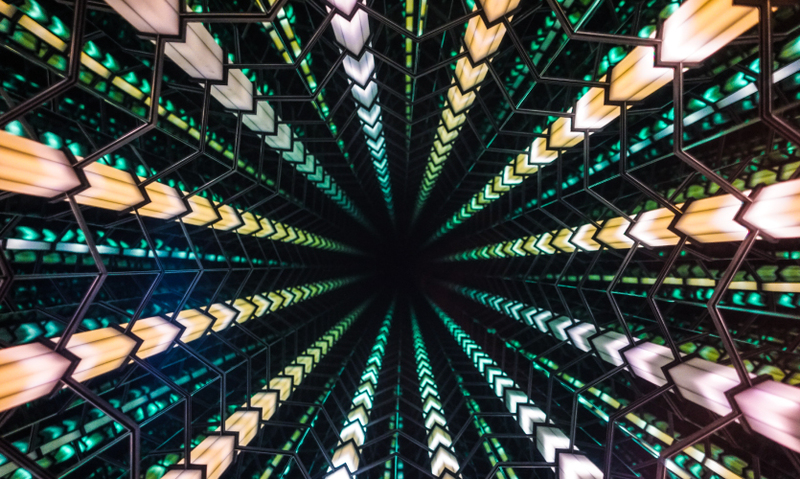 A visitor stands on the one-of-a-kind Infinity Mirror. 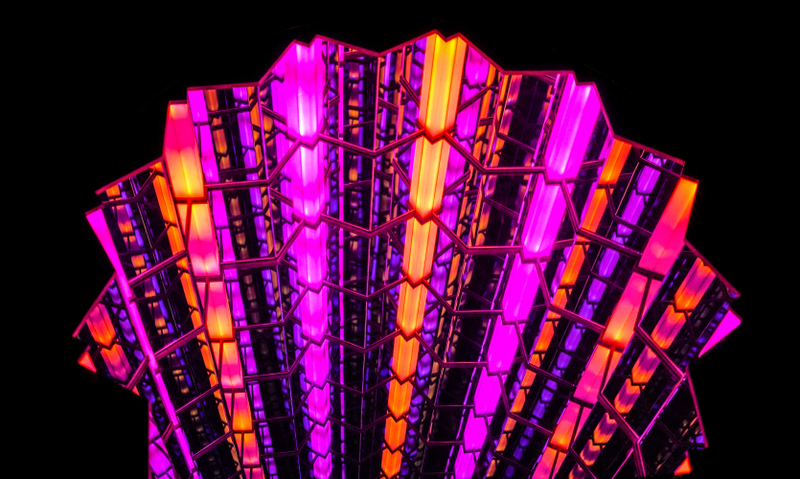 LEDs in the fixture respond to visitor presence. 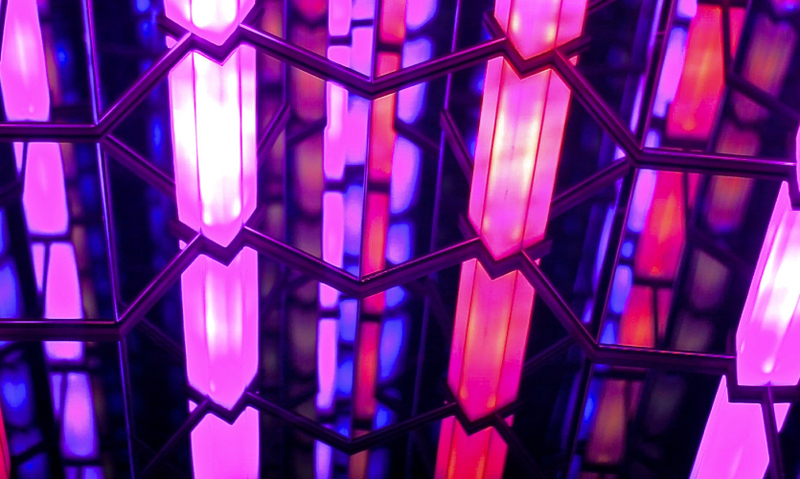 The Infinity Mirror mimics the unique shape and lights at the crown of the building. Color schemes can be easily changed by operations staff. High quality mirrors in the fixture make the effect appear to drop off into infinity. The final installation prepares visitors to elevate the remaining floors. 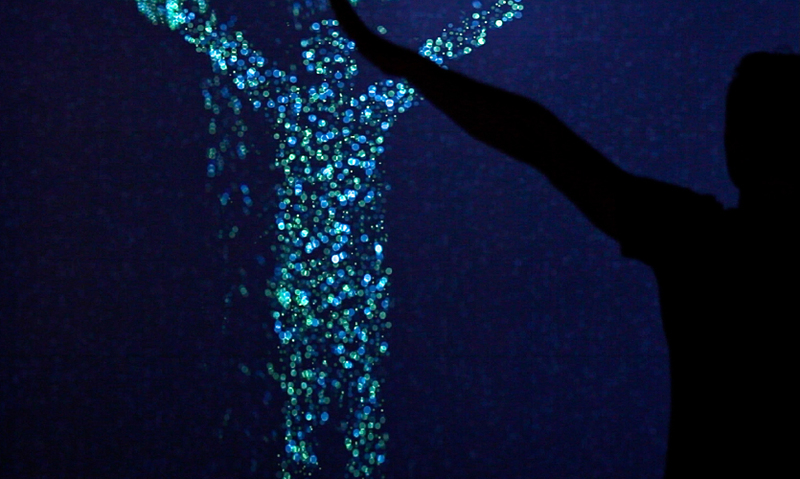 The Reflection Wall experience playfully tracks visitors’ body shape. A timed “flash” freezes their poses for posterity, before the bubbles are lifted up up and away. An observation deck attraction wasn't part of the plan for The US Bank Tower in Los Angeles when it was built. The building is currently the tallest building West of the Mississippi, and offers some spectacular views from the 70th floor. It also requires visitors to take two separate elevators to reach the top. Visitors travel 54 floors in one elevator, then hike across the building to another elevator and continue their voyage to the 70th floor. It’s less than ideal, so the building’s owners and space designers from Gensler's Dallas and Los Angeles offices asked the team at Stimulant to create a purposeful, engaging transitional experience on the 54th floor. The goal was to create fun and anticipation—and not spoil anticipation of the view on the 70th floor. Stimulant aimed to design a range of experiences alluding to the view and the idea of ascension, but with a very "L.A." feel. The architect provided a thoughtful set of design principles, but it was up to the Stimulant team to assess what technology could bring to the experience to make it more authentic and contextually relevant. Naturally, the next step was to design and build it all. No one said that would be a cakewalk. The 54th floor of the US Bank Tower had some features that presented a unique challenge. There was a two-story shaft between floors, an old elevator trench in the floor, and a whole lot of windows. The client urged the team to take advantage of those features in a creative way. Another hurdle was convincing visitors to break away from their smartphones long enough to engage with the environment. The overall concept was to play with visitors' sense of direction as they ascend to the best view of Los Angeles and ride the groundbreaking SkySlide(a transparent outdoor slide 45-ft. long that connects the 70th floor with the East observation tower). The result is what Stimulant calls a "journey toward visibility": three installations that allude to movement up, down and around the tower and surrounding landscape, allowing visitors to discover hidden secrets and playful interactions as they explore the space. 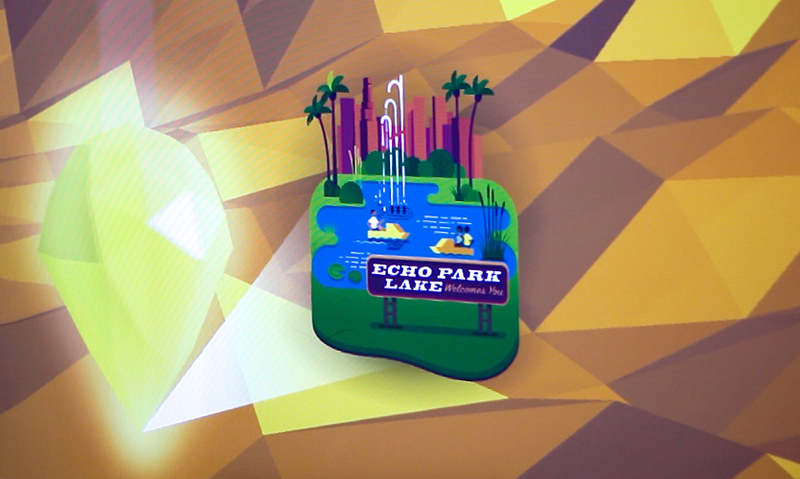 They are downtown Los Angeles' first and only permanent public immersive digital experiences. 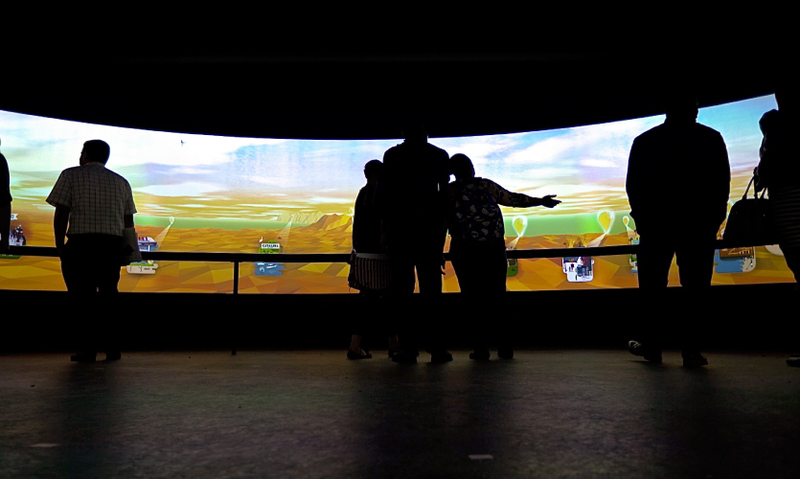 The first installation is the interactive 360 Landscape, a 50-ft. by 30-ft. projection-mapped ellipsoid area. The 360 Landscape surrounds visitors with an abstract representation of the topography of Los Angeles as seen from the 70th floor of the US Bank tower, while a custom-fabricated LED handrail uses visual cues to beckon visitors to come closer and investigate. 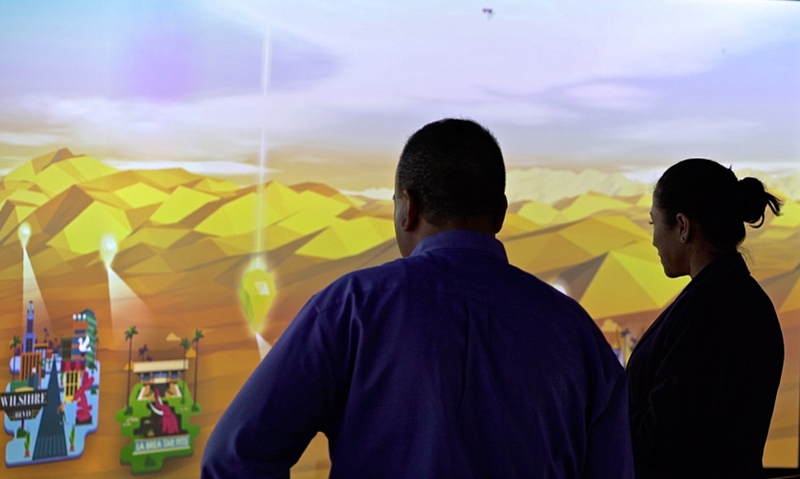 Prompted by sensors, gems appear on the screen, hover over the virtual landscape and burst as visitors move, revealing playful graphics that describe points of interest. 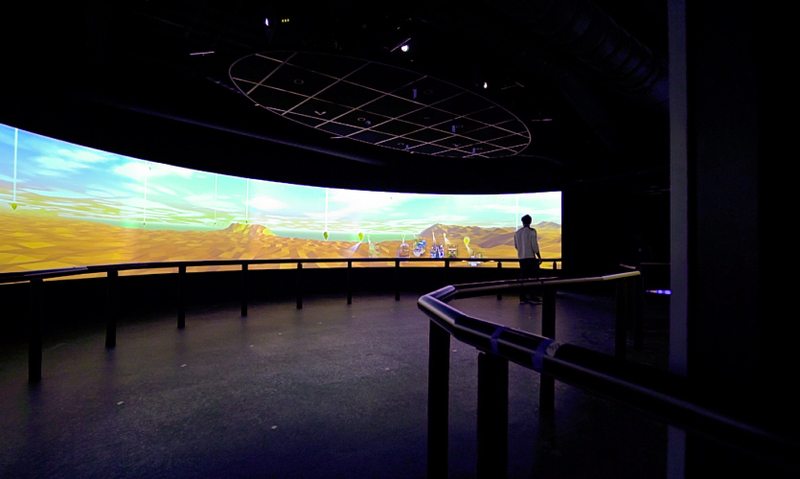 The projection-mapped ellipse is versatile, too; it also has a video playback mode, which plays video content produced at up to 11,520 by 1,200 pixel-resolution, synchronized across two walls. The second attraction again plays with motion, while celebrating the building in a fun way. 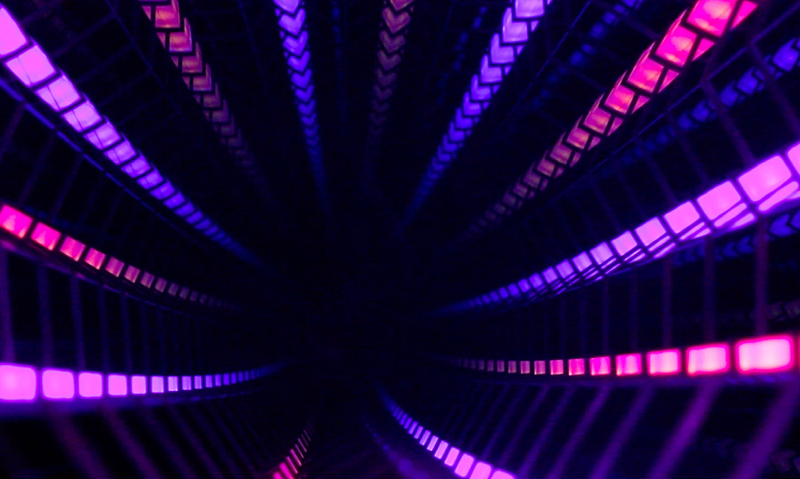 It's a one-of-a-kind (possibly vertigo-inducing) infinity mirror in the floor. 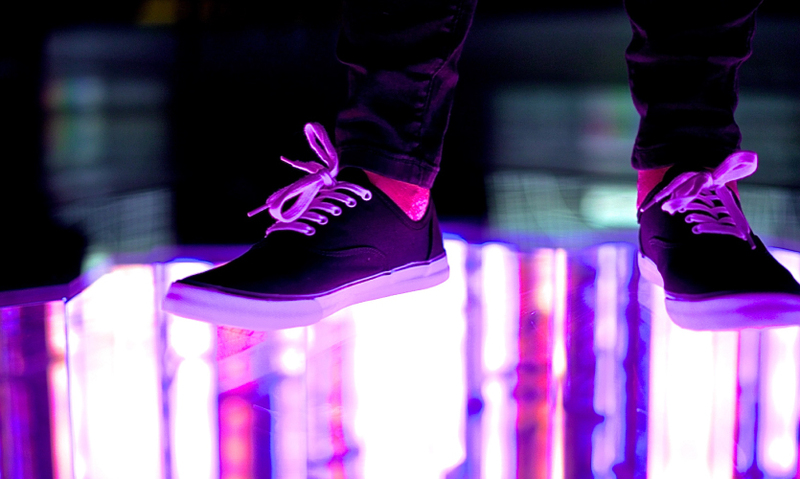 Sensors and LEDs respond to the presence of visitors and begin to animate in a spirited fashion. The graphics themselves mimic the form of the lights on the crown of the building. High-quality mirrors inside the fixture create the illusion of the floor dropping down to infinity, and the actual depth below the glass remains a mystery to guests as they snap selfies standing over the effect. "People freak out and think they are actually standing on a piece of glass over a 50-ft. hole. It's a very high-quality illusion," said Darren David, CEO of Stimulant. The final portion of the experience is called The Reflection Wall. 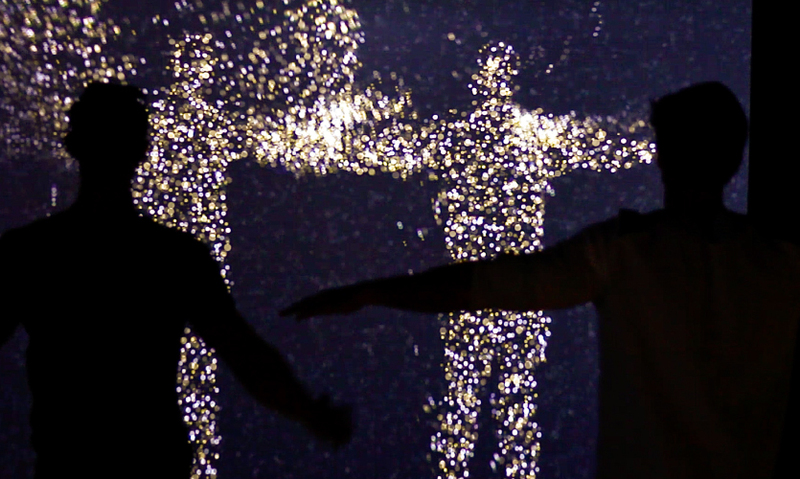 It uses a Microsoft Kinect sensor and a 30-ft. projection to track visitor movement and body shapes, recreating them graphically with thousands of digitally effervescent bubbles. A timed "flash" freezes their poses momentarily, and then the bubbles are lifted up and away by a virtual breeze. The greatest achievement for the Stimulant team, however, was the creation and deployment of a proprietary platform they dubbed StimuSense. StimuSense is, in essence, a "middleware" platform. A variety of sensors can be used and their input stitched together to form a unified sensing zone. That allows for the creation of hotspots in physical 3-D space, which enable a variety of new kinds of interactions derived from different forms of visitor motion. Once a region is mapped, a response to a particular stimulus can be programmed. For example, if two people stand in a certain spot in the room, a specific graphic response could be programmed to happen in the environment, and the response could be different if only one person were there. Things like proximity, movement, direction, walking speed and level of traffic are commonly used stimuli. The number of interactive permutations is entirely dependent on the type and quantity of sensors employed. Darren David said of the treatment, "It's really rewarding to see people's faces when they realize the space is reactive and figure out what the space can do, letting their curiosity guide them." Using StimuSense, Stimulant was able to reward varying levels of visitor attention. 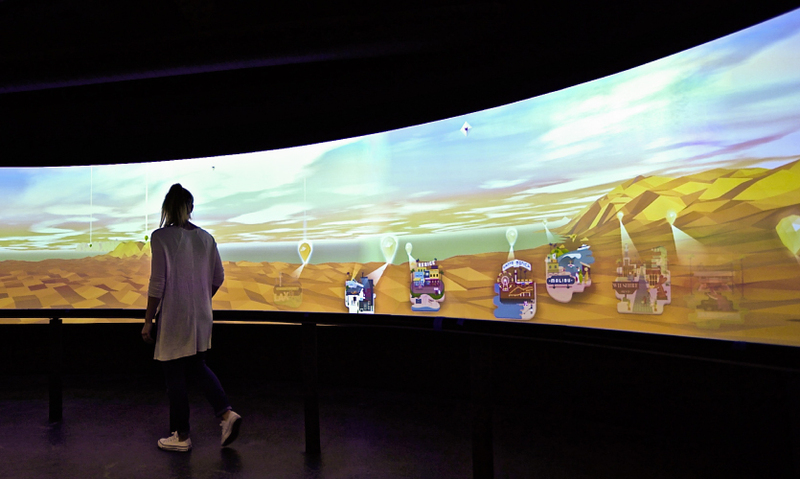 When the level of foot traffic is high, StimuSense mitigates the wait by facilitating deeper levels of interactivity; for visitors moving quickly through the space, even superficial engagements are rewarded with a playful response. The system captures these patterns of movement and user behavior, providing valuable analytics to the operator. The space was prototyped to scale in Stimulant's office to test the tracking system and sensing zones and dial in the cause and effect of movements, what would happen and at what rate. They also did pre-launch user testing on site to fine-tune the interaction. 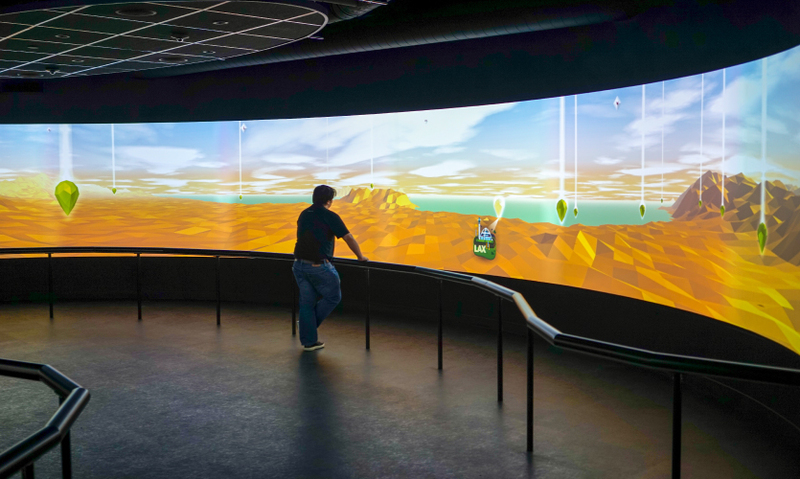 The design and development of the software took five months and, after waiting a year for construction, deployment of the interactives took six weeks. "The most challenging part was that there were so many different layers involved, and it was all happening very quickly. We had our A/V and lighting partners and our fabricators integrating with the people doing the electrical and building out the space. 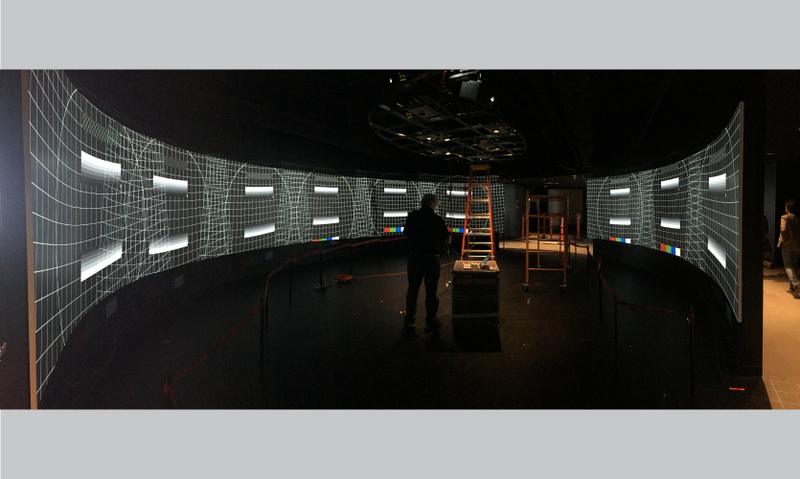 There are no digital screens in the space—everything is projection or LED based, so there was a lot of coordination with the cabling, walls and finishing," said David. The StimuSense platform will continue to be an immense asset in driving next-generation interactions in physical space for the team, for whom the US Bank tower project is their fifth observation deck. The trend of observation decks as more than just a great view—drawing a crowd by providing richer, more engaging experiences and shareable moments—isn't going anywhere. Operators are looking for site-specific experiences that add value to the ticket price and surprise and delight visitors. A platform that's fully updateable and provides feedback data like StimuSense undoubtedly adds value to the operators.